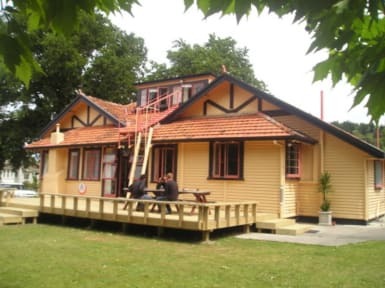 YHA Gisborne is a nice cozy friendly location close to the centre of Gisborne. It has easy access to harbour, cafe`s, night clubs and other attractions. The YHA Gisborne is also nearby to Gisborne's stunning beaches. 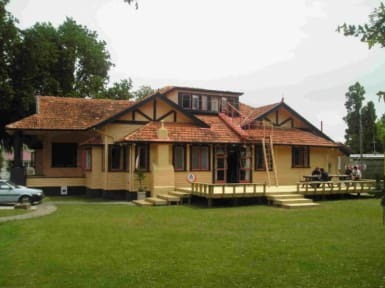 The hostel is set on large grounds and provides a great venue for your stay. Reception is open 8-10 in the morning and 4-8 in the evening. Please call if arriving outside those hours. Thanks! Nice atmospheric place. I was in the 'cottage' part out the front. Nice but noisy, some part of it was inconsiderate door slammers at all hours, but the likes of the toilet door cannot be shut quietly no matter how careful... it snaps shut with a loud report due to the ball bearing. Could so with some rubber stripping around the doors so no or at least less sleep interruptions during the night. Staff were really good and lounge kitchen very nice. Well located, clean and tidy. The house itself is quite old and so the spaces are not well proportioned- there’s limited space to eat and sit inside. Friendly staff who were happy to accomodate our requests for space to lock bikes etc. The location is good, walking distance to the town area. For what the place is, it does it well. The little common area is a good place to hang out and chill. The rooms are quite big. I stayed in a 10 bed mixed room however there were only a couple of us, at one stage it was just me (time of year I suppose). Cleanliness wise it was average, the showers were okay, the bathroom location was alright but a bit of a walk from my room upstairs. All in all, the hostel was good. Quiet hostel, and a good location for the town as a whole. Great as a little stop over, but couldn’t imagine staying more than one night. Spacious kitchen and decent WiFi, only real downside was the lack of atmosphere overall - but that’s more of a personal thing. Good value for money on a budget. Had a good stay for one brief night, the kitchen was well set up. The bathrooms were in a separate block from the rooms, but it wasn't a huge issue, the water pressure was great! Only issue was the wifi could only be accessed in the living area, and you only get a free 200MB. Needs some renovations. For a YHA it needs to be upgraded to a better standard.